When we moved into our house a couple years ago, I decided we needed a cute theme for our guest bath. 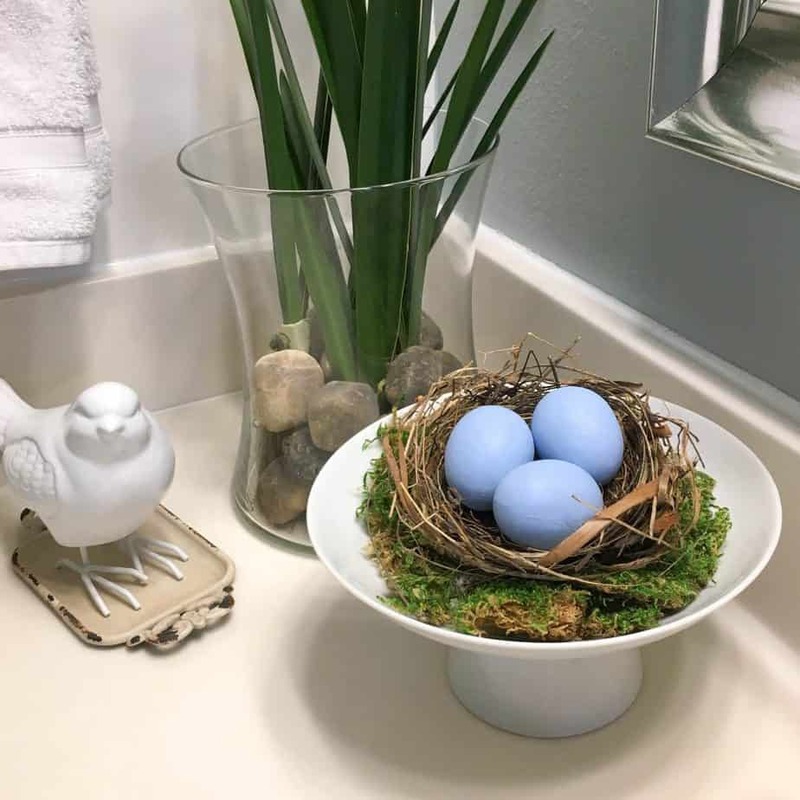 I’m not really much of a “theme” person when it comes to decorating but I decided this little bathroom would be the perfect spot for some bird’s nest decor. 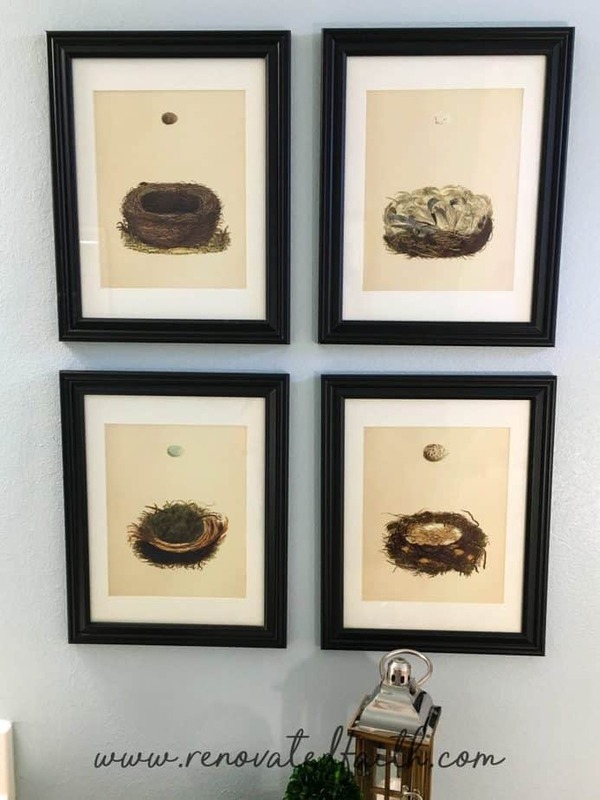 This post will show you how to make your own vintage nest wall art on a budget and implement some bird’s nest decor ideas of your own! About a year ago, the water supply line to the toilet in our guest bathroom burst and left two inches of water over most of our house. (You can read about that in my post Beauty From Chaos: How to Find Peace in Any Situation.) This bathroom is the room that sustained the most damage but in spite of it, I still held to my little nest theme. I remember Jeremy’s grandma saying that when you absolutely love some aspect of decor to hold onto it, because chances are, you will ALWAYS love it and as it brings you joy for a reason. I don’t know what it is about bird nests that are so appealing to me. Maybe it’s the hint of spring or the thought of something new and wonderful on the horizon. But I know that I love the concept of our home being a nest or haven for the three of us. 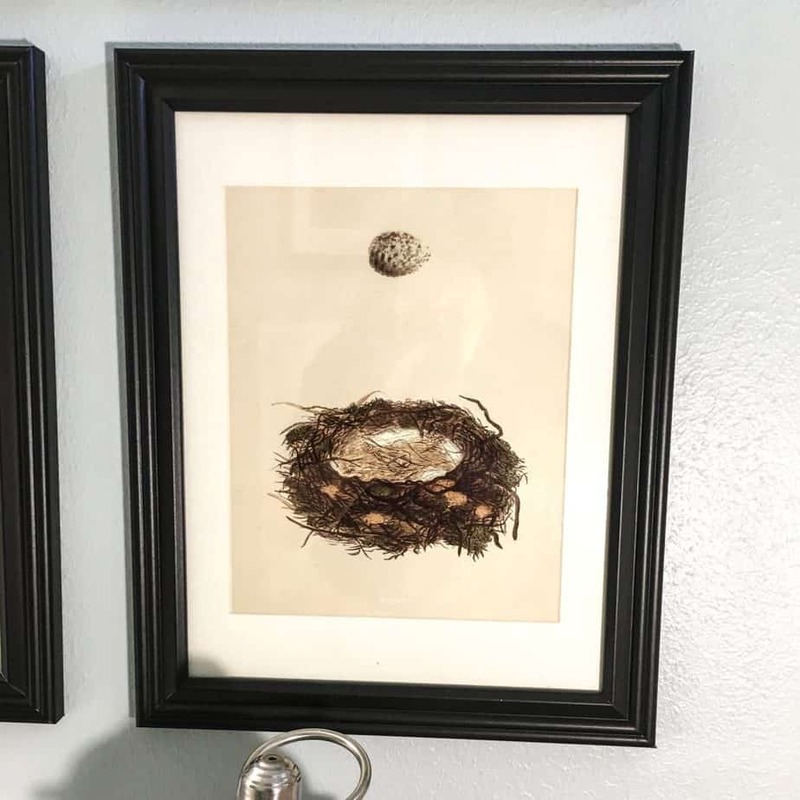 My favorite aspect of my bird’s nest decor ideas are my framed prints. They have that vintage-botanical vibe that you so often see with flowers. But I like the twist of seeing the eggs and nests in this same style. This botanical look gives such a classy style to our guest bath and the dark frames give a nice contrast against the light blue-green paint color. 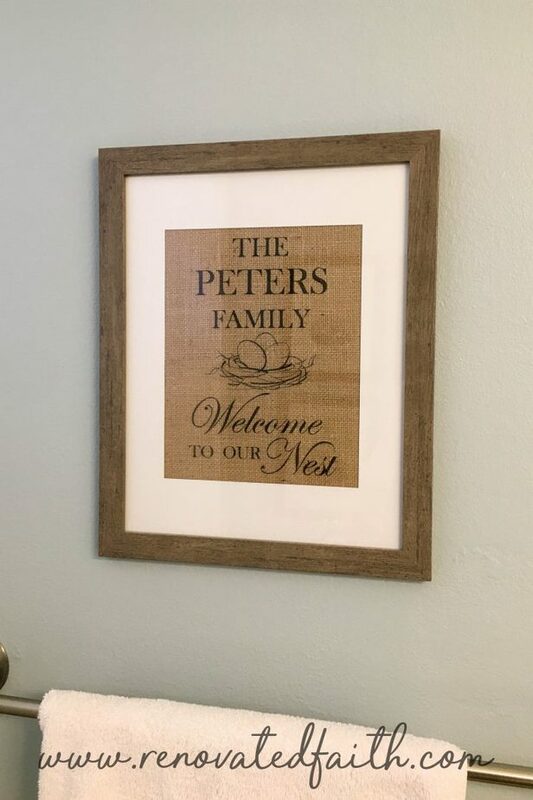 I first shopped Etsy.com and found lots of options by searching “botanical nest prints” but my absolute favorite were these nest prints from Rhine and Stone where Lisa gives multiple bird nest printables for you to choose from. Each download is only $2.50! Once I downloaded the printables I uploaded them straight to this portion of the Walgreen’s site and had 8×10 prints the same day. With using their coupon code, the prints were each $2.40. 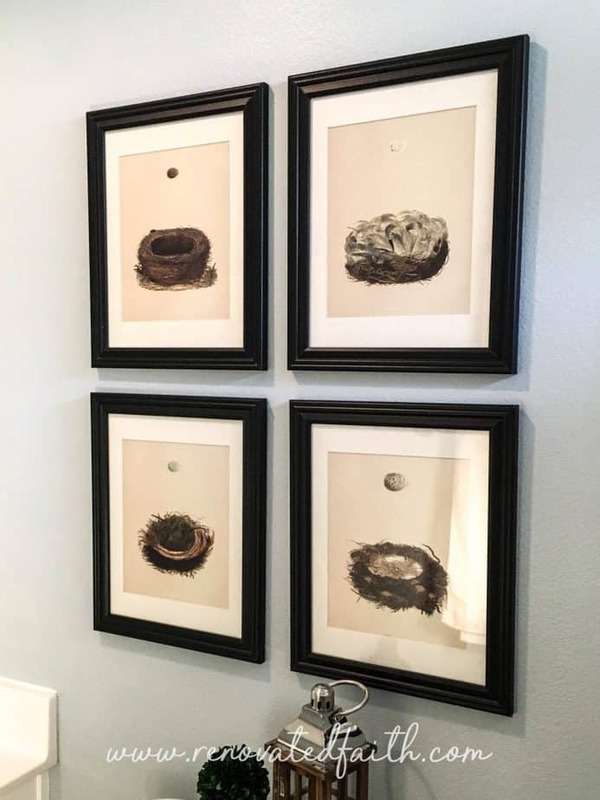 4 Vintage Bird’s Nest Prints– Download them HERE and have them printed in 8×10’s HERE. 4 Frames – I used these frames from Michael’s for $7.49 each. My total was $49.92 for my own customized art work which is pretty great considering that similar botanical style wall art will usually retail for over $200.00. I wanted to implement the nest theme in other aspects of the room so I bought some faux paperwhite stems and put them in this glass container. Faux paperwhites are not cheap for some reason but I found these at Walmart, which are not as high as some. I added rocks from my yard and you could even include some moss to the top if you wanted. So the bird’s nest in this picture is not just any bird’s nest – it’s the real deal! It is an actual cardinal’s nest from a Mama bird that laid a nest in a hanging basket in our living room window. Morgan and I had the best time watching her feed her ever-demanding babies! After they flew the coup, I carefully got the nest out of the hanging basket. Being the germaphobe that I am, I sprayed it (ok, drenched it!) in alcohol and now it’s a permanent fixture in my decor. I added the moss at the bottom which adds a nice touch of color. Also, this 6″ cake stand (similar here) is just perfect for decorating around the house with your own bird’s nest decor ideas! Did you know that you can spray paint decor to make it look like porcelain? The little bird was actually bright green before I spray-painted it with white gloss spray paint! No one can tell it is not porcelain. I’ve spray painted several things in gloss white and they all turn out super cute! As my friend Lillie says, spray painting is my love language!!! 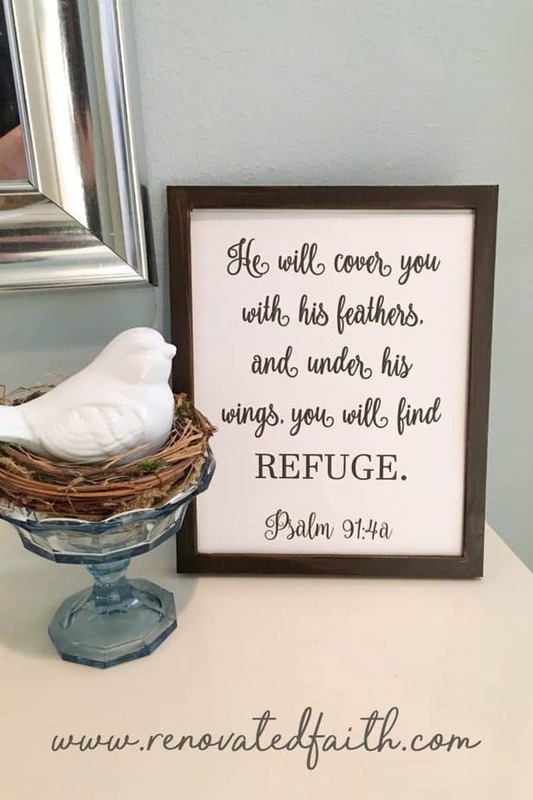 As always, I’ve made a free printable verse of Psalm 91:4a “He will cover you with his feather and under his wings you will find refuge.” You can get it and all of the other free printables by subscribing to the blog in this post here. If you already a subscriber, go here and type in the password that is at the bottom of your last weekly email. 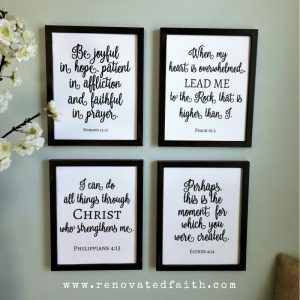 The printables are designed in a complimentary style so that you can make your own gallery art with your favorite Scripture verses! This “soap dish” is an old parfait glass from a collection my mom had and used often when I was little. Those beautiful parfait glasses even made Blue Bell taste better! I love implementing sentimental items in my decor as it brings back such great memories. Last but not least, I had this printed here on Etsy. I thought it turned out really cute and it would be really easy to do it yourself with your printer using these instructions from Julie at julesandco.net. You could even find a free clip art bird’s nest online. Easy Peasy! I used a small poster frame at Michael’s that was less than $6 on sale. 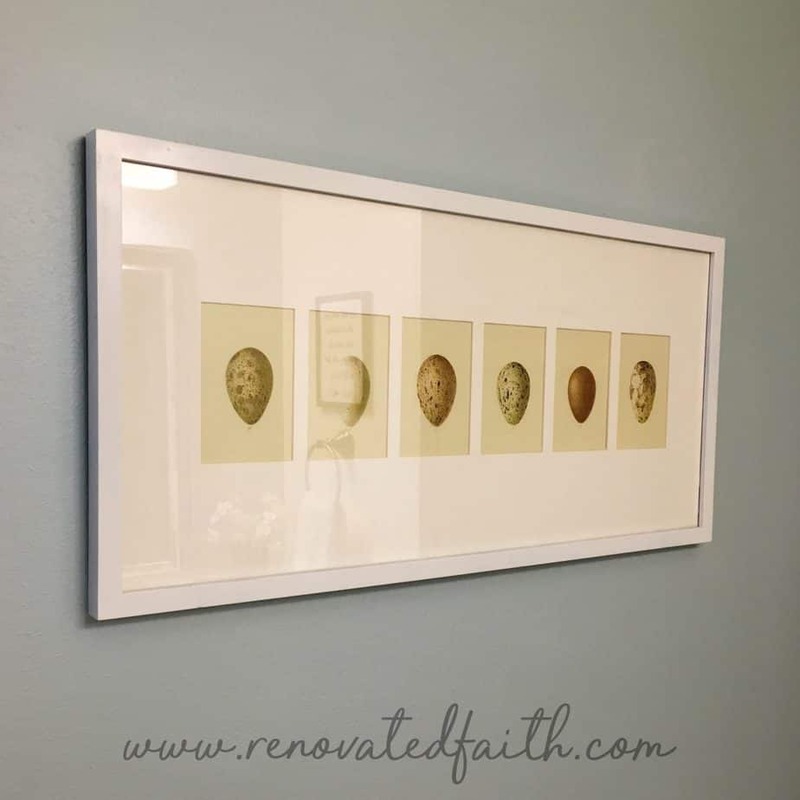 I’m all about re-purposing so I used this old frame and mat to take the egg theme a step further. I love it because I can easily change out pictures. Last time, I had pictures of old windows that I downloaded and printed from unsplash.com. I got these egg images from Etsy.com and printed them on my printer. 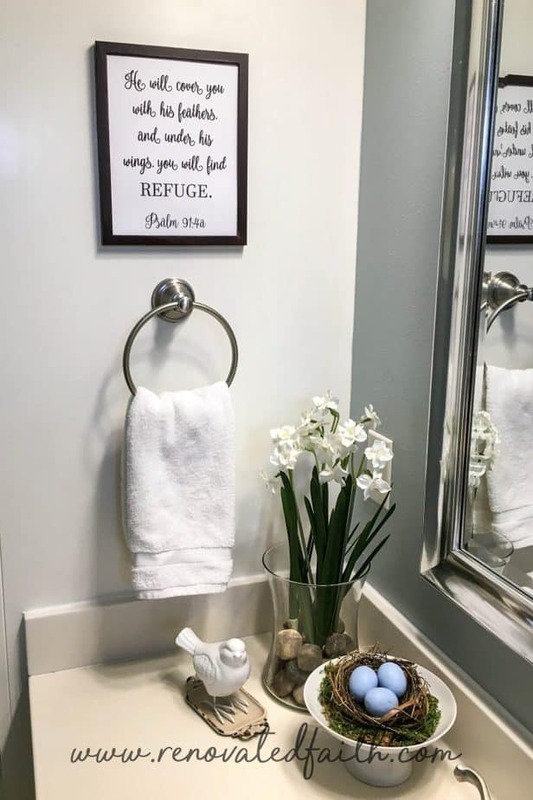 Our bathroom turned out beautifully and the bird’s nest decor is such a fun reminder of the true purpose of our home! 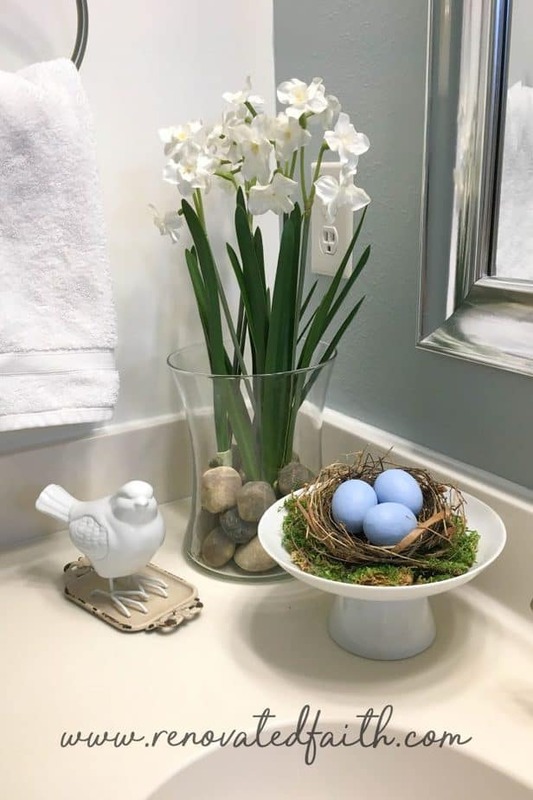 Here are some ideas of other bird’s nest decor you might be interested in! Next week, I’ll discuss why I love to look at our home as a nest and how I think makes a house a haven! 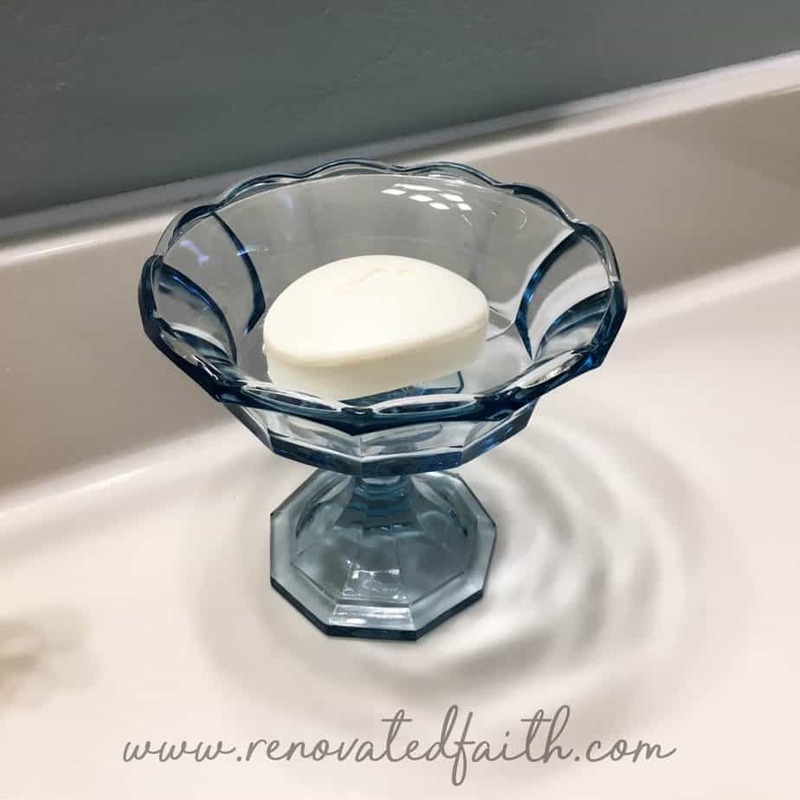 Be sure to subscribe to the blog so you don’t miss it! I love this! Such a unique idea and so different from everything I’ve seen! I love that you have a real nest in your bathroom!